Crazy for Ewe – "Chris Bylsma"
First Friday and a special surprise! Don't forget that tonight is First Friday, and we have a terrific project for you - Mary's Glamour Cowl. Ginni just finished another sample with a beautiful chocolate colored fur trim. 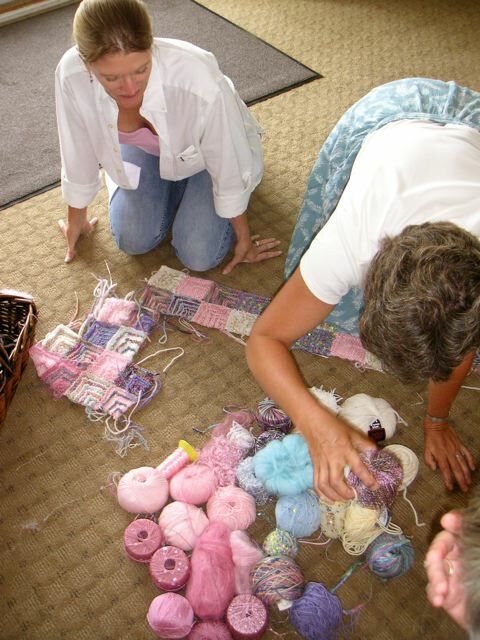 Come pick up a kit and let us help you get started on this gorgeous project. We have a special surprise for you today. The Lovely Chris Bylsma will be joining us from 3-5 in La Plata and from 6-8 in Leonardtown. Stop by to meet her and see some of the gorgeous sample garments she's brought to share with you. They're all gorgeous, and even better in person, so be sure to stop by and see them all. The second day of that workshop was on the Symphony jacket and creating a beautiful fabric by blending yarns. 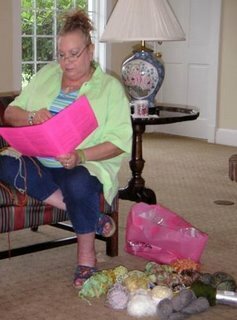 Combining yarns is one of Chris' passions, and it really is a fun creative outlet. There was also a section on playing with bits of this and that to create a kind of fabric fringe that adorns her latest Chanel-inspired jacket, Paging Coco. Chris will be sharing many of these techniques during the upcoming workshop, so you don't want to miss it. I was looking over some photos of previous classes we'd had with Chris, and decided to share them with you. 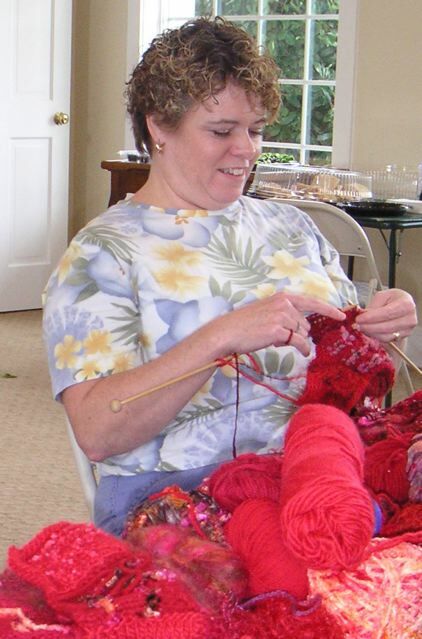 Chris' first visit was in 2007, when she came to teach finishing and edgings. 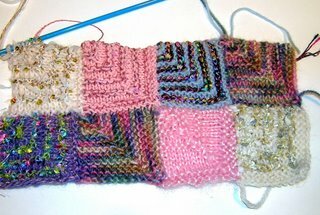 First was seaming techniques, picking up stitches, and more. 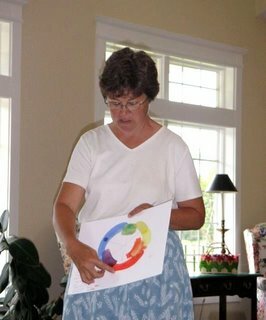 She is very much a hands-on teacher who really engages with her students. 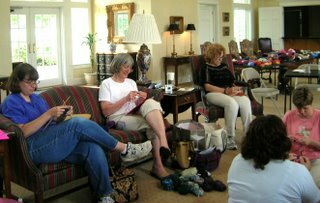 I've just posted the Chris Bylsma classes on the website, so registration is open! 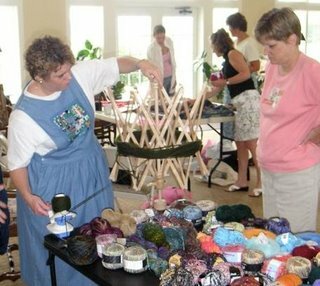 The classes will be taught at the shop - Saturday in La Plata, and Sunday in Leonardtown. It's been a while since Chris has been able to visit us, and I have missed hosting her. She is a lovely person inside and out, and it's always a pleasure to see her. 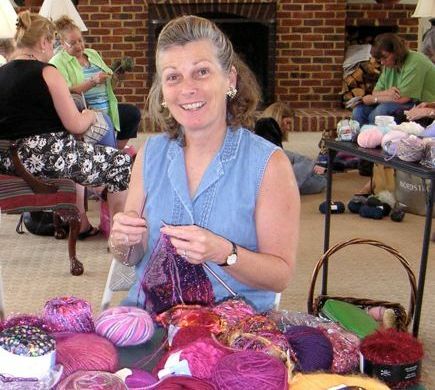 Although you've all seen and admired her designs in the shop, if you're new to Crazy for Ewe, you may not have had the opportunity to take a class with her. So, let me take a minute to introduce Chris, and tell you why I like her so much. As a designer, Chris is talented and unpretentious - her garments are a perfect match for the Crazy for Ewe knitter -- she deigns for the way we live. Her garments are stylish without being trendy - chic without being fussy or pretentious. They are your BFF garments. You know, the garments you reach for time and time again because they're attractive and great-fitting, and they're easy to wear. Chris Bylsma garments are wonderful wardrobe items that become an essential part of your life. Being wardrobe essentials, does not mean that they're plain or boring. Chris' designs are full of beautiful chic details that make them a special. The effect is not one that shouts "Hey, look at me." It's more the quiet confidence that comes with any well-tailored piece of clothing. They are very much at home in every situation - professional, casual, or dressy situations. They just work. I have knit nearly a dozen of Chris' designs, and I wear them often. Every time I wear one of Chris' designs, people compliment it. 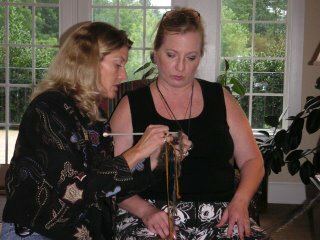 It's not just knitters either -- ordinary people who simply admire the garment always ask me about it. We all appreciate these details - who doesn't want to look pulled together and polished? As a knitter, however, I especially appreciate how easy Chris makes it to get that effect. She's all about making it easy and accessible. Special techniques like pockets, trim, edgings, and interior structural elements - Chris makes them all easy and available for you to incorporate into any garment you knit. It's a day of creative color play and technique development. You'll learn something useful, regardless of how long you've been knitting, and I guarantee, you'll have fun. 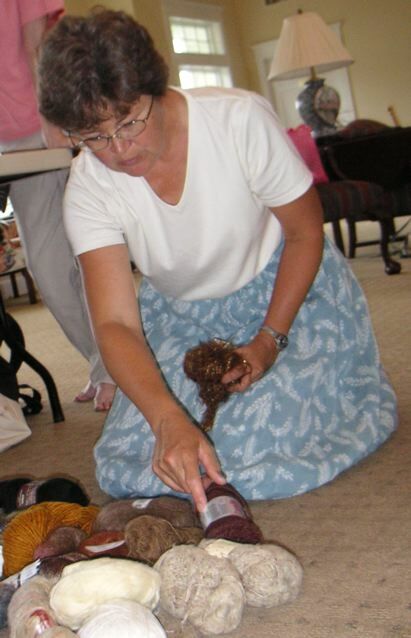 I wore my Take Two for the classes and presentations yesterday here at the Yarn Market News. I was surprised and flattered at how many people commented and asked me what pattern it was! It made me so proud and happy - thank you, Chris, for such a great design. In case you haven't seen, or don't remember all the beautiful examples of Take Two when we did it as a Fit and Finish, check out the photos below. 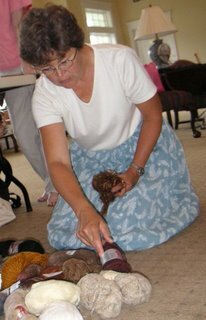 Take Two is a single strand of dk wool and a single strand of some other dk cotton or silk held together and knit in a slanted rib pattern. 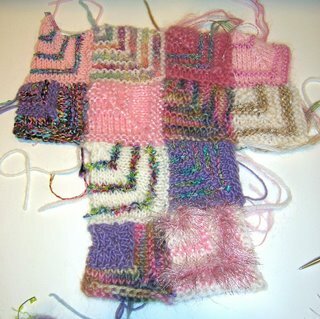 It's worked on size 11 needles, but for some reason, it doesn't look at all bulky - just sharp and professional. Spring is a great time to do Take Two because we have a really great selection of dk cottons and silks in stock, so it's easy to find just the right color combination. Last Saturday and Sunday we all started our Crayon Box Jackets. Christina showed us about hue, saturation, value, and all that good stuff. a color pallet. Lori' s jacket is full of rich earthy browns and blues. We practiced picking up stitches, making mitered squares, and had a generally grand time. Thanks to everyone who shared the weekend with us. Here are some more photos of the retreat. Here's a close-up of the second row. I totally love the yarns, and am really looking forward to working on this. Just need to get Cate done so that I can wear it while it's still hot.